Handpicked for its ability to delight design aficionados, this one-of-a-kind chair always turns heads. With an upholstered interior in a soft buff colored velvet and a contrasting satin swirl fabric on the outback, this chair can blend seamlessly into any decor. 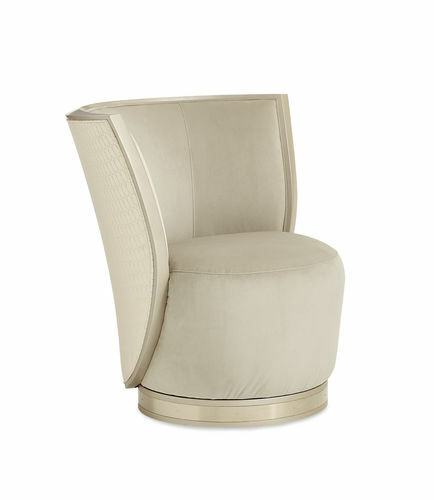 Its swivel base makes it ultimately functional, while elegant finishes in Pearl and Whisper of Gold add expressive elements of style. Swivel base. Decorative metal band around wood base. Barrel back. Tight seat.